House Auctions in York PA Finally Revealed in NEW Video! 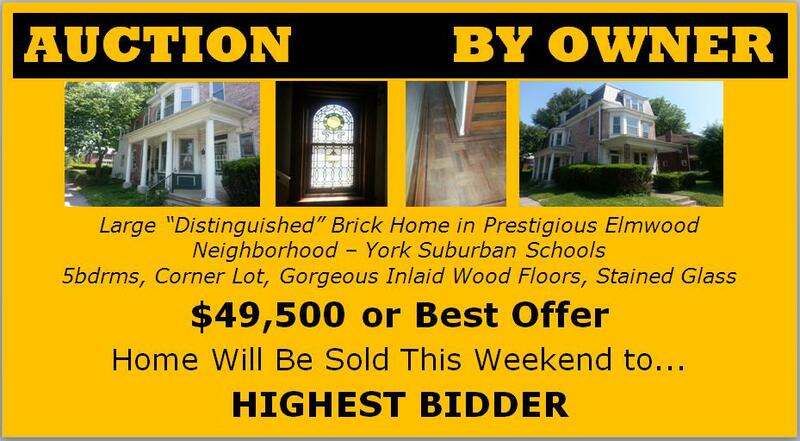 "Discover How to Literally STEAL This York Suburban Home in Prestigious Elmwood for 'Pennies-On-The-Dollar' With One of the Most Ground-Breaking AUCTION Sales Ever!" This is NOT an ordinary AUCTION. Your Bid is not binding. You can get involved with as little as $1.00. Bargains you can acquire with the Rehab Vault AUCTION method are tremendous. The home to the right is worth $180,000 but we are starting bids at only $49,500 or Best Offer! This home will be SOLD Sat June 15th from 12-2pm to the highest bidder & we only have one available right now and this AUCTION will not be repeated! To learn more about the home we're Auctioning Off and how the Rehab Vault AUCTION works, please let me know your name and email below and I'll send you an email with an information sheet on the home above. YES, Email Me Details On This Home & Give Me "INSTANT ACCESS" To The VIDEO Which Explains How This AUCTION Works! Our House AUCTIONS take place ONLY ONCE and go quick and I don't want you to miss out so please provide me as much contact information you can because I will try all channels to get in touch with you. Your Cell Phone information is crucial because I often text these opportunities to you too.